Home Wallets Exodus wallet. Review. Registration. And again hello, in this article we will make a review of the wallet, which is slightly different from those wallets, reviews of which we did. Today we will learn what is Exodus wallet. Exodus Wallet is a stationary multi crypto wallet. By the word stationary, we mean that it should be installed on the computer. Exodus is available on Mac, Linux and Windows operating systems. 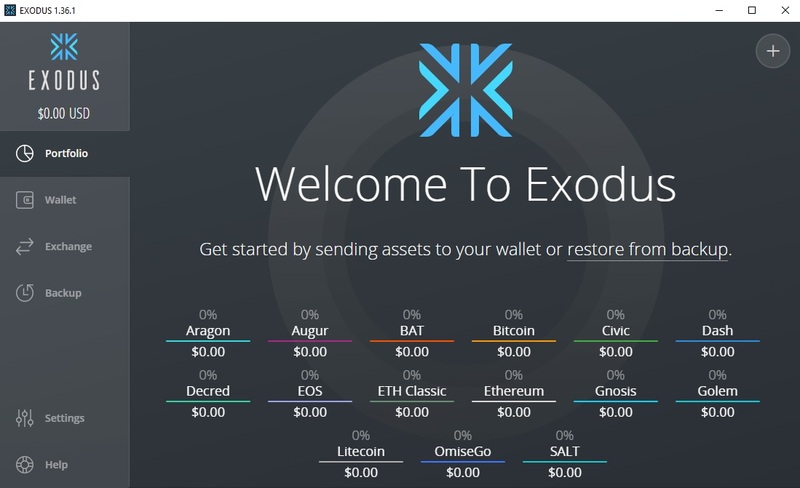 You can download Exodus wallet on the official website exodus.io. 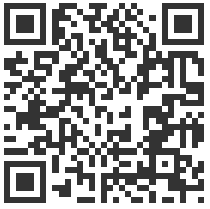 To download you need to click on the “Download” button in the upper right corner of the site, where usually there is a button that helps connect in online wallets. After clicking, you will be offered to choose the operating system on which you install the Exodus wallet. 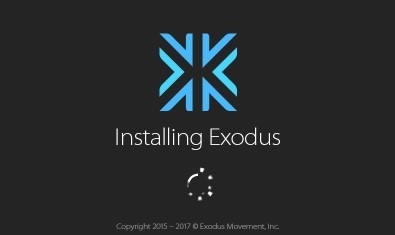 Installing Exodus wallet takes about 1-2 minutes, and during this you watch this window. After installation, a shortcut with the Exodus logo will appear on your desktop. The first impression of this wallet is very positive. The design is unique in its kind, nothing like, for the moment, we have not yet met. After the launch, you are greeted with a home page with the phrase Welcome to Exodus. On the same page, you can see all the cryptocurrency that supports Exodus wallet, before you write what cryptocurrency supports Exodus, look at it. Yes, you did not seem Exodus wallet supports 15 cryptocurrencies: Aragon, Augur, BAT, Bitcoin, Civic, Dash, Decred, EOS, ETH Classic, Ethereum, Gnosis, Golem, Liecoin, OmiseGo, SALT. Above the name of cryptocurrency, you can see a percentage that displays the amount of a particular currency in relation to all cryptocurrency. Since the Exodus wallet is empty, we have zeros everywhere. Under the name cryptocurrency, its equivalent in dollars is indicated. The next section of the Exodus wallet will be the “wallet”, which has this kind of. Here you get access directly to each of the 15 wallets. 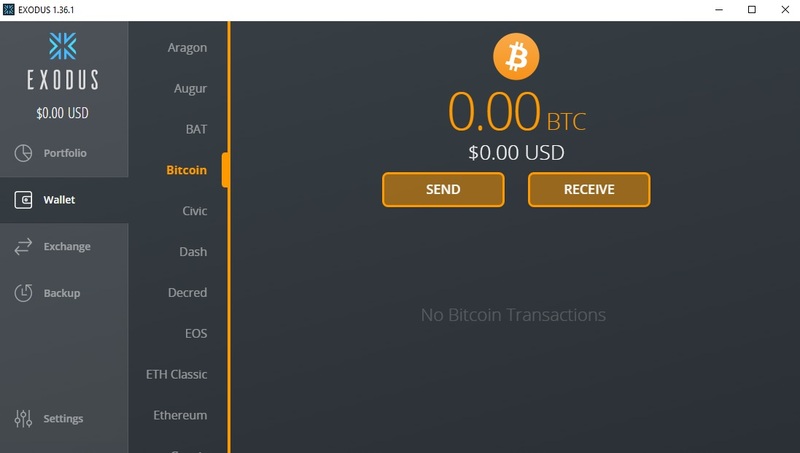 To send money, you need to click on the “Send” button, to receive money and view your Bitcoin address in the Exodus wallet, click on “RECEIVE”. The Windows to send and receive look like this. Exodus wallet has another very useful function, internal conversion function or the function of exchanging cryptocurrency inside the wallet. However, this function has one small minus – the commission, which charges the resource itself. It is due to this is monetization of Exodus wallet. The commissions in our world will not surprise anyone, they are everywhere, and pay them for everything. The design of the Exodus wallet is its distinctive feature, but it can also be changed through the Setup menu section. This review has been brief. We don’t know what about you, but we’ll start using Exodus cryptocurrency wallet to store your savings in cryptocurrency. If you need a wallet, with less cryptocurrency, but which is highly trusted, you will find a wallet blockchain, review of which you can read here. 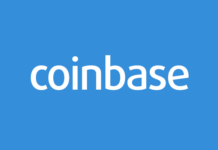 Next articleCoinbase wallets review. Registration. How to withdraw money?